When NC State and VF Corporation announced a collaborative, strategic partnership in January 2018, one of the goals was to support student development at NC State. To that end, two College of Textiles students have been named recipients of the VF Graduate Assistantship in Apparel and Footwear. This award supports outstanding graduate students conducting research on emerging and advanced topics in apparel and footwear of interest to VF, home to such brands as Reef, Wrangler and The North Face. The award recipients are Zahra Saki, a Ph.D. student in the Textile Technology Management program, and Inhwan Kim, a Ph.D. student in the Fiber and Polymer Science program. Saki’s project focuses on advanced recommending systems for online apparel commerce, while Kim’s project relates to advanced wearable technology applications. Read more about each student and their project below. The goals of the VF Assistantship award are to develop high caliber researchers with skills and passion for careers in the textile industry, and to encourage collaborative approaches to solving industry relevant challenges. Recipients were chosen in a competitive process based on submission of a research proposal and presentation of their concept and credentials to a faculty selection committee. The award provides an annual stipend and comprehensive student support package to enable recipients to dedicate their research efforts to the approved project. The College of Textiles and VF have a long-standing relationship; a recent multiyear partnership adds structure to existing collaborations and creates new opportunities for students in both the College of Textiles and Poole College of Management. Zahra Saki centers her research on online advanced recommending systems — artificial intelligence that recommends items (e.g., books, concerts, YouTube videos, products) to users (e.g., customers, app users, website visitors). “Better e-commerce tools are key to the future, and recommending systems are an effective way to connect with consumers in an online environment and to simulate the contact that humans might have in a physical space,” she said. Think the “Who to Follow” section on Twitter, Pinterest’s Recommended Pins and music on Spotify — but her focus is on the future of apparel commerce. Saki, originally from Iran, holds a bachelor’s degree in Textile Technology Engineering from Isfahan University of Technology and a master’s degree in the same from Amirkabir University of Technology, as well as an MBA from the Bahar Higher Education Institute. She also obtained an MITx MicroMasters Credential in Supply Chain Management. She worked for the Golrang Industrial Group for several years, first as a senior sourcing executive and then a procurement manager. She plans to graduate with her Ph.D. from the College of Textiles by or before May 2020. Inhwan Kim’s research is built around the concept “From molecules to ready-to-wear in inkjet printing e-textiles.” He is taking a two-pronged approach. 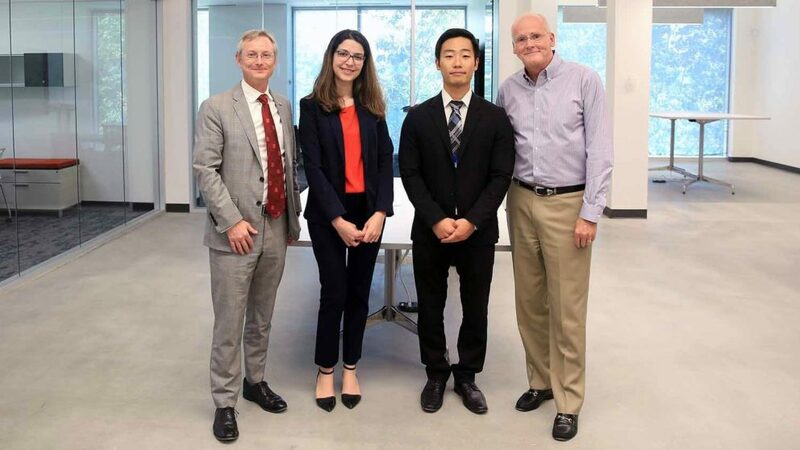 “I would like to perform both fundamental study on materials characterization, such as chemistry behind conductive inks, fluid dynamics and fiber forming polymers for smart textile fabrication technology, and practical apparel and footwear application based on use case scenario,” he said. His research could have a spectrum of applications, from sports and entertainment to the medical field and the military — and the technology could be smoothly adopted and utilized by manufacturers to meet demand from the public. “I strongly believe inkjet printing e-textile technology is highly scalable process in apparel and footwear production with high throughput,” he said. Kim is originally from Seoul, South Korea, where he attended Yonsei University. He graduated early with honors, earning a bachelor’s degree in both economics and clothing and textiles and a master’s degree in the latter. He studied at the University of California, Davis, as an exchange student. Recently, he was one of 15 students to receive a $2,000 scholarship from the Specialty Graphic Imaging Association; recipients hailed from eight colleges and universities and were chosen from a field of more than 200 applicants. He is currently a graduate research assistant in Fiber and Polymer Science and is part of the Nano-EXtended Textiles (NEXT) Research Group led by his advisor, Dr. Jesse Jur, which focuses on the design of smart textile platforms that enable improved materials integration of sensors, energy harvesting, energy storage and communication devices. The group’s ongoing research includes integrating strategies for electronic materials with textiles toward energy harvesting and sensing platforms.